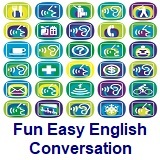 ﻿ Fun Easy English - new classroom free online classes english language lessons speaking listening writing reading april 2. 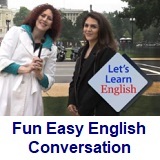 Today in the classroom you are going to learn about the 1,500 American English language words you should know. 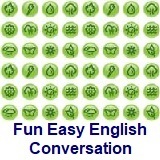 The Fun Easy English 1,500 Words You Should Know come from the VOA, Voice of America, Special English Word Book Vocabulary. 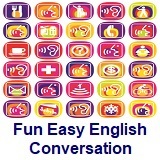 Special English, now called Learning English consists of 1,500 essential words which anyone learning English should know. 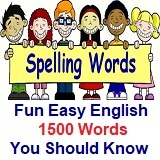 The following are the links to the individual word pages. Bob: Excuse me, is this seat taken? Bob: Would you mind moving over one, so that my friend and I can sit together? Larry: No, not at all. Would you mind is a polite request form meaning Are you willing to. Literally, it is roughly equivalent to Do you object to or Do you dislike. Therefore, to indicate that he is willing to comply with the request, the person answering will use a negative form, such as No, not at all or No, of course not. By this he means No, I don’t mind = I will be glad to. Moving. 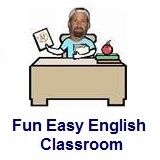 Notice that the verb following Would you mind… is in the ­ing form. Other examples: Would you mind opening a window? Would you mind waiting a few minutes? Would you mind speaking a little more slowly? Meaning is so that which means in order that. Meaning is no, I wouldn’t mind at all or No, of course not.